This article talks about the default/ Factory set credentials for HP virtual connect modules which includes HP Virtual Connect FlexFabric 10Gb/24-port , Flex-10 10Gb Ethernet Modules. 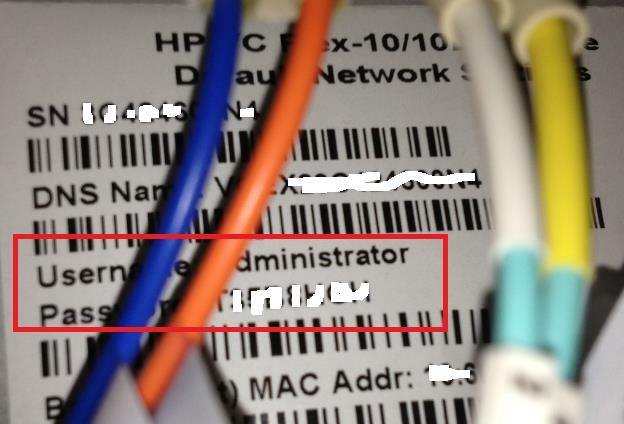 HP virtual connect modules with comes with the tag as shown in the following figure which contains Serial Number, DNS name, user name , password and MAC address. If you lost the login credentials for any reason, refer this article for instruction to reset Virtual connect password. Richard did good job on documenting steps.